Tattoos are a means of portraying one's inner self as well as his or her ideas or emotions. 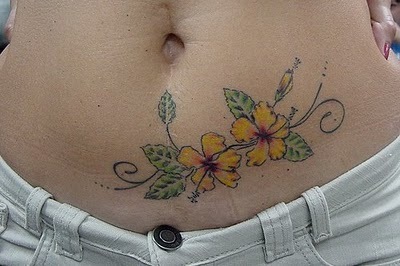 The hibiscus is a flower whose portrayal as a tattoo can bring out these features in an effective manner. It also serves as a popular substitute for the more common ideas of using roses or other standard flora. The flower can reflect various ideas with the idea of it as a delicate piece of art being one of the most popular ones. Other than this, another meaning behind using the imagery of this flower is to be opportunistic. The tattoos' colours range from bright purple to red to pink hues that properly represent the Hawaiian flower. 1. The placement of the tattoo is crucial to its beauty and aura of perfection. As important as the design maybe, where you decide to place the design on your body makes as much a difference as the design itself. Trailing hibiscus flowers or falling flowers are very effective as well as widely used in order to bring out the flower in accordance to the curves of your body. Try using hibiscus flowers that vary either in their sizes i.e. it decreases in size or remains consistent. The various flowers used can be of the same color or can be done in an array of different paints or shades of the same colour to add some spice or life into your design. One can also add leaves or light water designs to add some more life into your creation. Although one can use various numbers of hibiscus designs yet it gives the entire image more depth if other related images are also used. Being a tropical plant, one can consider images of sands, waters or mountains to give your tattoos more balance and depth.